It was a warm May afternoon. May 22. 1961. About 30 activists, mostly of college age, were huddled in the Montgomery, Alabama, mansion of pharmacist Dr. Richard Harris. They were from the Student Nonviolent Coordinating Committee (SNCC) and the Congress of Racial Equality (CORE) and they had two goals. One: persuading Martin Luther King Jr. and CORE leader James Farmer to allow them to continue the Freedom Rides to Jackson, Mississippi. Two: They also wanted King to join them. A group of young activists from Nashville, Tennessee, led by Diane Nash, and a group from New Orleans led by activist Oretha Castle had rushed to Montgomery to plead their case as to why the Freedom Rides should continue. These young men and women were also convinced that they would die in two days. But the CORE and SNCC members, mostly younger and more rambunctious than the 32-year-old King, were determined that the rides should continue despite that certainty — and believed that he should join them. The pivotal meeting signaled a generation gap in the civil rights movement that endured through its existence. King had never participated in the Freedom Rides and, for some, this signaled a reluctance on his part to put his life in direct risk. That he may have felt too important to join others in the field. But the story is obviously more complicated. Martin Luther King Jr. at First Baptist Church on May 21, 1961. My father, David Dennis Sr., was part of the New Orleans contingent and part of that meeting with King. He was a scrawny 20-year-old Dillard University student and had joined the movement after trying to impress the beautiful Castle by joining her at a sit-in at Woolworth’s lunch counters. He’d been assured he wouldn’t be arrested. Well, he sure was arrested and the mistreatment he witnessed in the jails moved him to spend the next few months training Freedom Riders in New Orleans, where hundreds of eventual riders would be taught how to stay calm while being spat on and beaten, how to protect themselves from violence, and how to stay safe in the face of certain danger. My father grew into a passionate community organizer and field secretary for CORE. He was integral to the planning of 1964’s Freedom Summer. But in the Montgomery meeting the man who became my dad 25 years later was just a kid who wanted to help. The fire he had for equality was there. His longtime friends are quick to tell stories of his passion for civil rights, and his willingness to speak his mind. That intensity is still there 50 years later when I hear him talk about the ’60s and the ’70s, and when I hear him speak on current events. It’s hard to imagine my dad being unsure of his place in the fight for civil rights, or unsure of anything, really. (L-R) Freedom Riders Julia Aaron & David Dennis sitting on board interstate bus as they & 25 others (bkgrd. & unseen) are escorted by 2 MS Natl. Guardsmen holding bayonets, on way fr. Montgomery, AL to Jackson, MS.
“I was in awe of [King’s] presence,” my father says now. “I was in a dreamland, being around all of these people I’d read about [through the 1950s]. I was wondering if I belonged there.” Though my father would eventually become a field secretary for CORE, when he went to Montgomery he was without a title and just eager to contribute something. And he was overcome by the reality of being in the same room as King in such a tense moment. “Troops are on the way in from Montgomery now,” King said on the night of May 21. The Freedom Rides were a very organized attempt to protest segregated interstate bus terminals in the South. The plan was to have black and white activists board buses in Washington, D.C., and ride through the Deep South. On May 14, the rides hit a violent roadblock, literally and metaphorically. A mob had descended on a bus carrying freedom riders through Anniston, Alabama, slashing the tires and smashing the windows. Someone from the mob — which included parents with kids on their shoulders who watched the violence like it was a sporting event — tossed an explosive into the bus. The vehicle was filled with smoke and the riders were trapped inside, struggling to breathe. An explosion ripped the rear of the bus apart, allowing the riders to escape — only to be beaten by the waiting mob. Another group of riders were beaten by attackers with lead pipes on May 14 in Birmingham, Alabama. The mayor, Bull Connor, refused to provide protection for the riders because it was Mother’s Day. The violence led to a moratorium on Freedom Rides, and the belief that the movement had failed. King, upon hearing of the violence, flew from Chicago to Montgomery on May 21 to meet with activists to discuss the future of the rides and whether they should continue. But first, he delivered a speech in support of the riders at Abernathy’s First Baptist Church. He almost didn’t survive the night. Another mob, including several Klansmen, surrounded the church and threatened to beat or kill anyone who left. King and the members of the church were held under siege in the church until dawn the next morning, when federal marshals and the Alabama National Guard finally escorted them out. When King left the church, he headed to Harris’ house, where the pivotal meeting about the Freedom Rides took place. King was on probation for a bogus traffic violation from the previous May. And another arrest, which was guaranteed to happen if he joined the rides, would have resulted in him being in jail for months. There wouldn’t have been any way of getting him released, creating a growing possibility that he’d be killed at some point during his time in jail. “If they put King in that Montgomery jail, he would have never gotten out alive,” my dad recalled. A reminder of just how much danger King and other activists were in at the time. Rev. 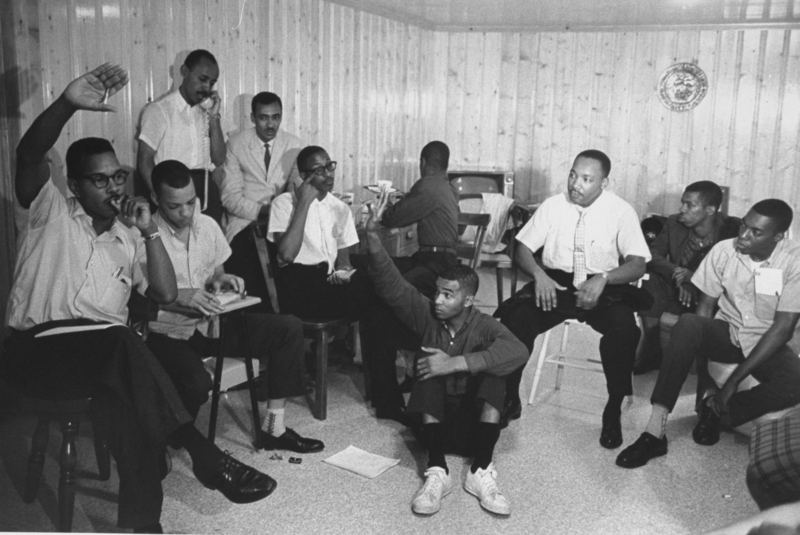 Martin Luther King, Jr. (3R) participating in planning session for Freedom Riders’ bus trip from Montgomery, Alabama to Jackson, Mississippi. For some, that was too much of a risk. Others believed it was a necessary risk that many other people on those buses were willing to take. King, to his credit, seemed amenable to going. It is pathetic that some of the students are under suspended sentences and some are three and four time losers for freedom, yet they are participating. Maybe, in King’s estimation, they are just students and only stand to lose their lives or careers while he stands to lose a fortune in struggle and blood money. There’s not enough space in this room for both God and fear, so make your choice. On May 23, King, Abernathy and John Lewis — a man of action who was sporting a bandage after being attacked by the Montgomery mob two days before, and who would join the riders to Jackson — held a news conference stating that the rides would continue. On May 24, my dad was with the first group of Freedom Riders out of Montgomery. 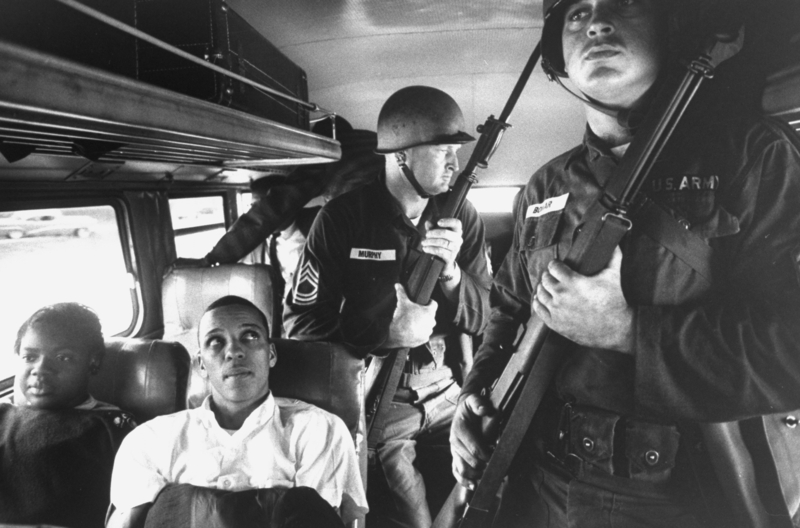 What the Riders did not know was that Attorney General Robert Kennedy had declared that the Freedom Riders would get National Guard protection along their routes and he vowed that there would be no more violence. What the Freedom Riders could not know is that seven years later, King would be assassinated in Memphis, Tennessee. And Robert Kennedy two months after King. And just last week, President Barack Obama proclaimed the site of the Anniston, Alabama, attack a national monument.